It’s asparagus season! There is one vendor at one of the local farmer’s markets that sells the most delicious asparagus, and I wait all year to buy some. Then I buy it every week and eat so much of it that by the time the season is over, I am ready to never eat asparagus again…until next spring. 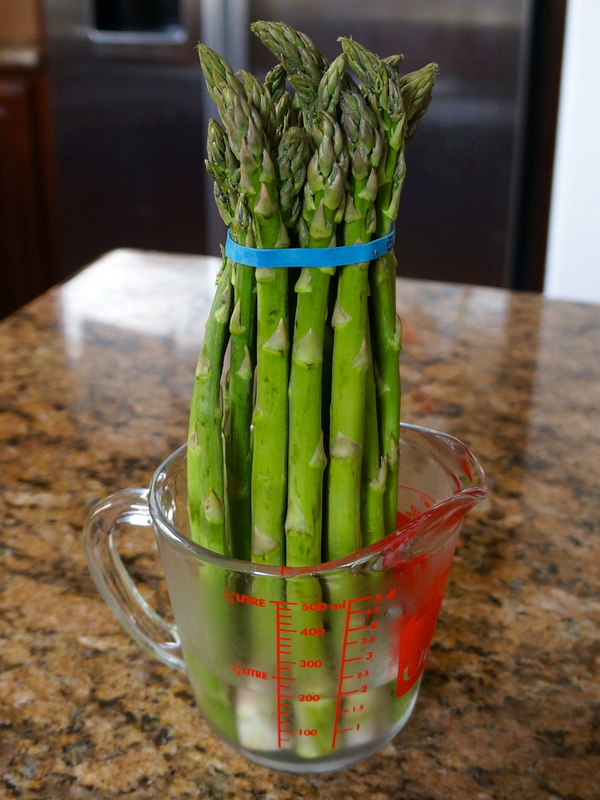 When you buy asparagus, look for bright green stalks that are firm and evenly formed. The tips shouldn’t be mushy or wet. Whether you get thinner or thicker stalks is purely personal preference–they all taste the same, but have different textures. Just pick a bunch that looks good to you. When you get home, refrigerate your asparagus upright in a glass or bowl with an inch or two of water. This will keep it crisp and fresh-tasting for a week or more. And if you forget and store it sideways, you might notice that the stalks will start to curl upward; like flowers, they will reach for light! Asparagus tastes great in all kinds of preparations, and I’ve tried several, but I prefer this no frills approach that highlights the unique flavor of the stalks while allowing it to pair well with just about any meal. And one of my daughters likes it this way, which is a win in my book since she often dislikes cooked vegetables. I like the texture when it is cooked this way. When I cook asparagus whole, I find that if I overcook it, even just a little, it gets stringy and/or chewy. I don’t enjoy that. Pre-cutting the stalks eliminates this texture challenge (for me at least). It cooks quickly and easily this way. 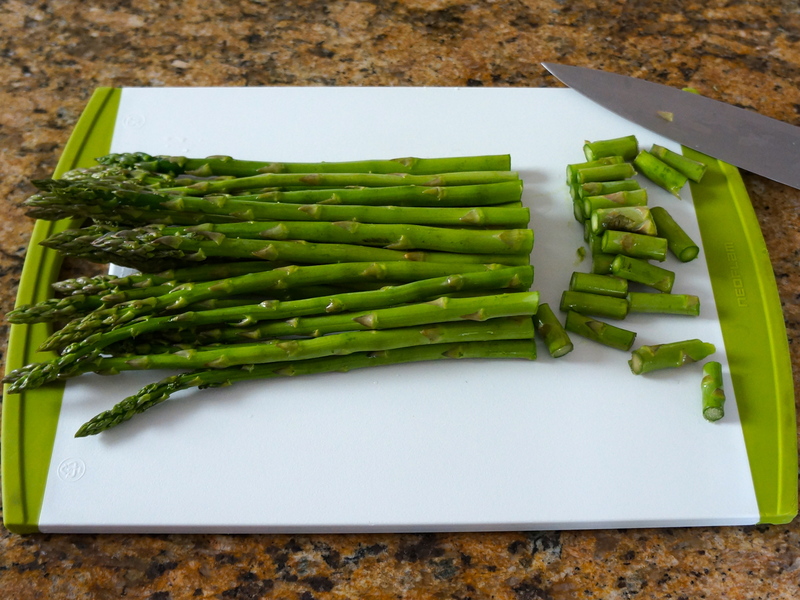 Cutting up the asparagus allows me to stir the pieces around and get them cooked evenly with little fuss. When you cook the stalks whole, you have to flip them over to get them cooked on all sides. This isn’t a big deal, and really isn’t that difficult, but for a multi-tasking mom who just wants to cook something quick and easy, this method works best for me. I don’t have to cut up the pieces later for the kids (or myself). 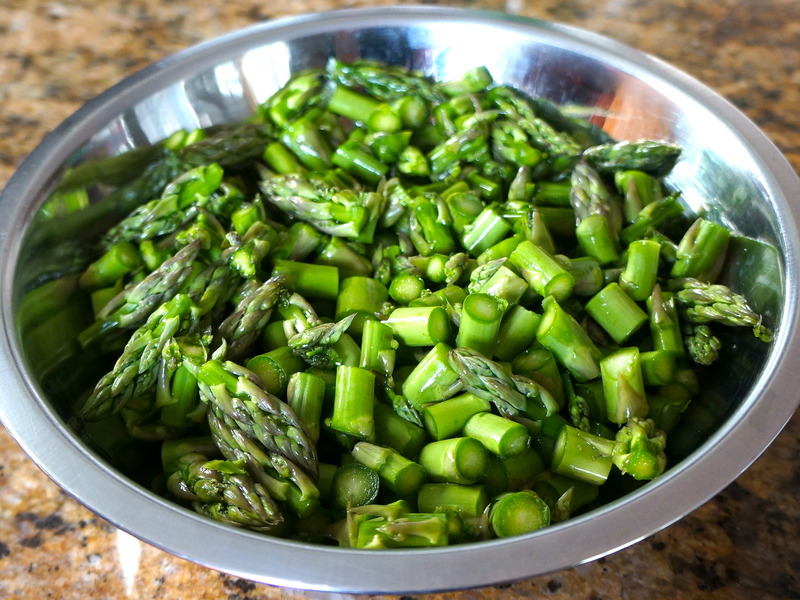 Raw asparagus is much easier to cut up than cooked, and it saves time getting food dished out and into their little bellies. And that means I get to eat sooner, too! 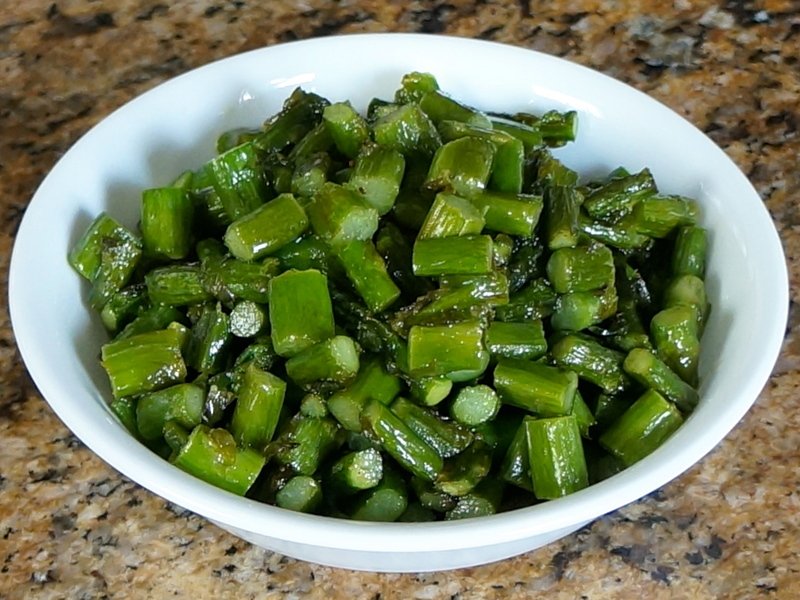 This Simple Asparagus with Butter is a great side dish, and it works well as leftovers, too. 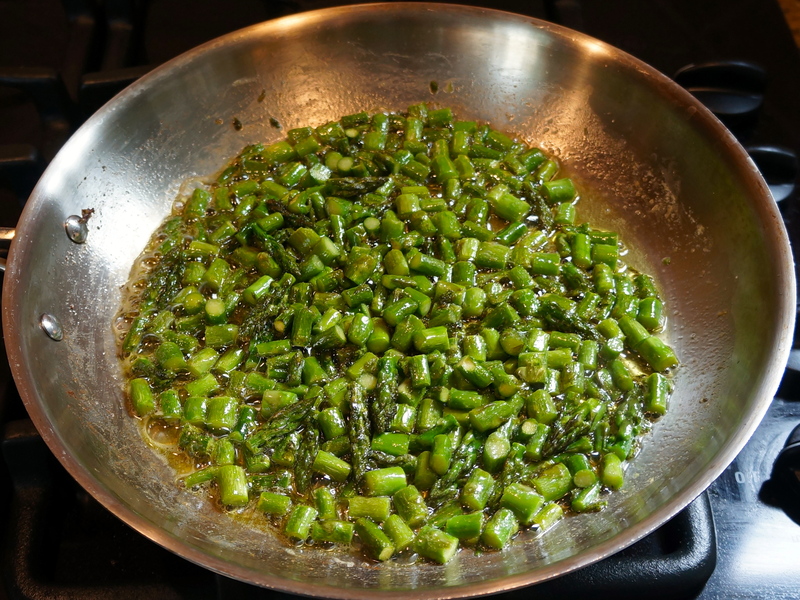 Try it in my Asparagus Bacon Frittata, mixed with some ground meat, or added to a stir fry. And get some asparagus before it is gone! 1/2-1 stick of grass-fed butter (2-4 oz. or 4-8 Tbsp.) Really, you can’t use too much butter, right? 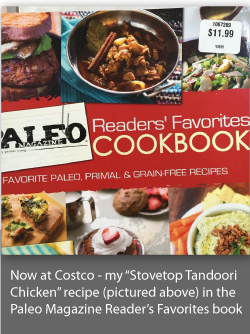 Or you can use ghee for a similar flavor, but without the dairy solids. Wash and cut the asparagus. I usually discard the bottom inch of the stalks. 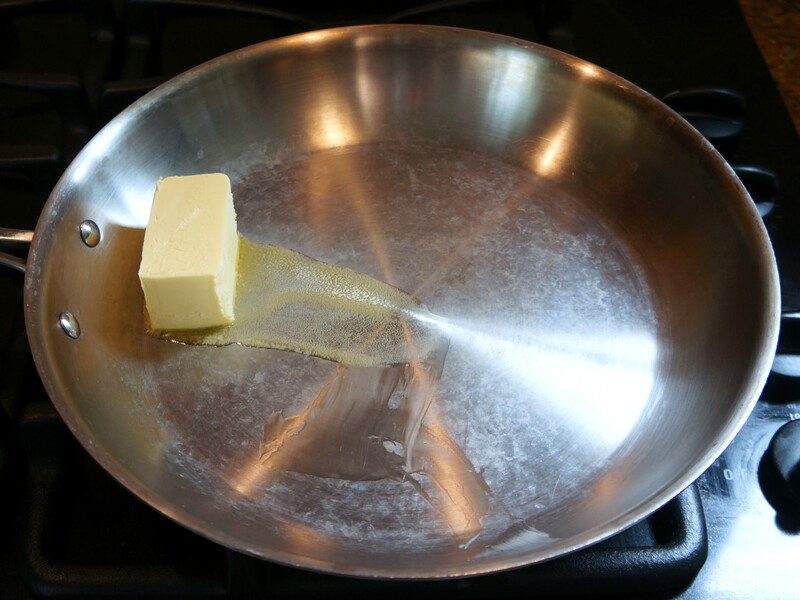 In a large stainless skillet, melt the butter over low-medium heat. When the butter is melted, turn up the heat to medium. Add the asparagus and a bit of salt to taste. Stir to combine and let cook, stirring occasionally, for about 10 minutes or until it is as done as you like it. Test for doneness and salt, adjust as needed, and enjoy!